Just saw this email come in. So while my free trial is long expired, I assume these features will be free through my app starting in March? Just got my email too. Love it that they got smart on this cause since my trial ran out I could have cared less about any of it. Yeah, these three are neat features. I know some were talking about the remote unlock/lock being available but it never worked for me. This is neat...thanks Audi! Funny I was just now messing around with the myAudi app and was thinking it was worthless. 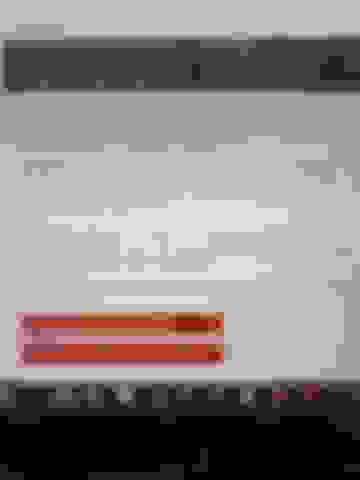 Mine doesn’t have anything available on it. Are we getting complimentary Audi Connect now? Knowing Audi, it may just be a generic email or lazy work on their part to just send out a mass email to new owners in the past few months that still are on their trail as well as people who let their subscriptions lapse over a year ago just to try and rope them back in. I could be wrong but I am definitely skeptical/cynical about Audi and this offer. It was a decent feature to remote lock-unlock but I can't say I used it often. The locator was nice. If these features are just free from now on, good on Audi; but I can't help but think it's a lazy email sent out to people already on a trial or paying customers, as well as people whose subscription long expired but Audi couldn't be f'd to filter those accounts out. We'll see in a month what it really is. Or if someone has talked to their Audi salesperson or service adviser and asked about it? 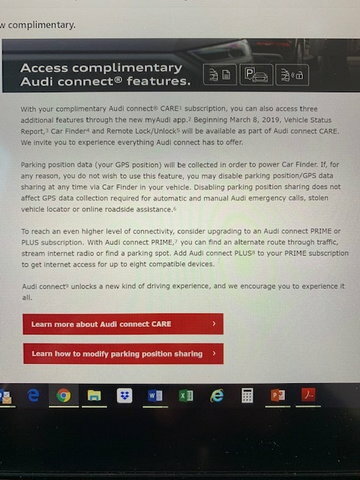 Having just taken delivery of my first Audi in many years, I'm a little bit lost, trying to understand and figure out if any of the Audi Connect Prime or Connect Plus offerings are worth the money. At first glance, I suspect not, but maybe I'm missing something that should make me reconsider? Any guidance on the value of these would be most appreciated. Audi's subscriptions have always been a rip-off. I still subscribed. Doesn't make any sense, right? I simply didn't want to drive a crippled down $90K vehicle. Well, in the past, you paid $200 for 6 months to get the fancy google earth maps and remote app features. Now, you seem to get the app-features like unlocking/locking for free as well, making the $200-deal even worse. From now on, I'll only keep the WiFi hotspot for $20/month and let my Prime subscription expire. Another poster discovered that this is an option as long as you sign up for Plus as long as your Prime trial or paid subscription is still active. So they are introducing a AudiConnect CARE package in addition to existing PLUS and PRIME. We get these for FREE with CARE: Vehicle Status Report, Remote Lock/Unlock and Locate Car. I wish they added Google Earth to this free tier so that they can really show off the full potential of virtual cockpit. Anyway its a better than nothing. I have to say the Google earth does not do much for me. The only feature I really like is send to car from Google maps or the app. I guess I have to still pay for that.